The MS power film resistor family from Caddock are axial-lead resistors with a wide resistance range from 20Ω to 30MΩ and a maximum operating temperature of +275°C. These resistors have a power rating of up to 22W at +25°C and maximum voltage of 6000V. 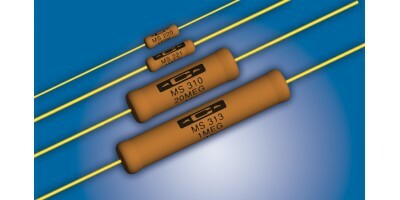 Caddock MS power film high voltage resistors are cost effective high voltage resistors. Caddock MS power film high voltage resistors performance begins with Caddock's Micronox® resistance films which are fired directly onto a ceramic core at temperatures above 1400°F (760°C). These resistance films have demonstrated outstanding stability when exposed to a high ambient temperature, thermal shock and high power densities. Most models are manufactured with Caddock's non-inductive serpentine resistive pattern that provides a truly non-inductive resistor that is about as inductive as a straight piece of wire the length of the resistor body. Caddock MS series lead material is nickel clad copper with thin gold plate, solderable. 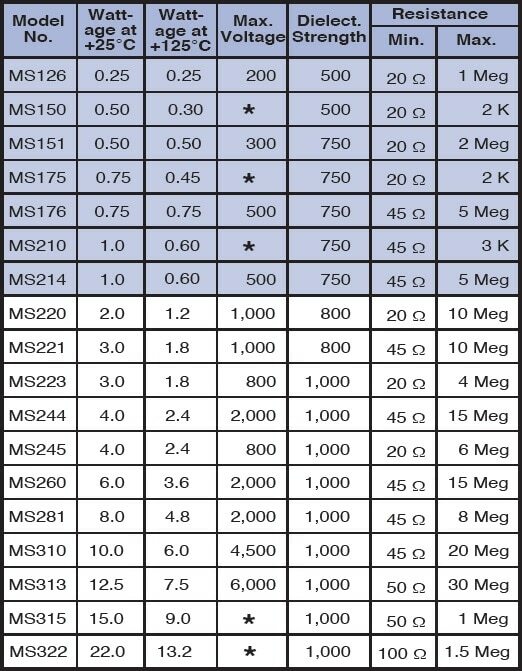 For welding applications, optional pure nickel leads are available on Models MS126, MS150, MS151, MS175, MS176, MS210.